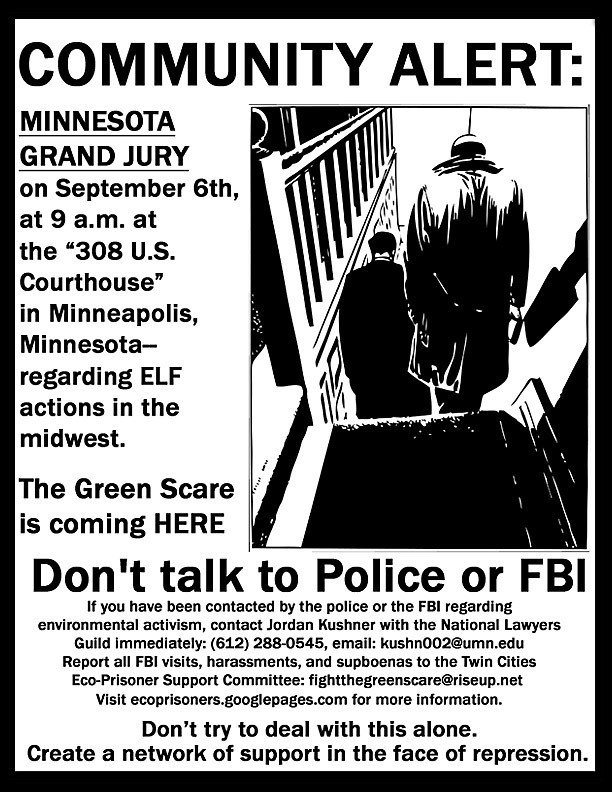 New Grand Jury in the Midwest: Another “Eco-terrorist” Witch Hunt? In a country where so many people get most of their news from The Daily Show, and 1 in 4 people read ZERO books last year, I can only imagine how many people get most of their information about the legal system from Law & Order. In Law & Order episodes, grand juries (if they’re mentioned at all) help the good guys investigate the bad guys who did bad things and must be brought to justice. Grand juries aren’t so benign. True, in Law & Order, and in real life, they help bring indictments against bad guys. But they can also be used to push a political agenda. They can intimidate, harass, and imprison political activists. They’ve been used against suspected communists, against antiwar activists , against Black Panthers, against independent journalists like Josh Wolf, and they’ve been used frequently against the environmental and animal rights movements (recently in the case of Jeff Hogg, and activists in California). So when a new grand jury subpoenas activists, it should raise red flags for not just other activists, but civil liberties advocates and criminal justice watchdog groups. That’s why I wanted to highlight this for everyone, even though details are limited right now. What I know is that this week two people were subpoenaed to testify before a grand jury in Minneapolis, MN on September 6. Based on their personal accounts, it looks like the grand jury is investigated so-called “eco-terrorism,” and could relate to the Operation Backfire cases. Both individuals–Tony Wong, in Seattle, and Brandon Elder, in Chicago–say they were told by law enforcement that someone named Ian Wallace has been cooperating with them for several months. …showed me a couple color copy photos of some type of vehicle or machine. The photos were dark and unclear and I couldn’t really tell what exactly he was trying to show me or why. Then Officer Swanson told me that I knew what he was showing me and if I cooperate it’ll be better for me. Swanson also told Wong that law enforcement had been working with Kevin Tubbs and Stan Meyerhoff. Tubbs and Meyerhoff are two of the defendants who cooperated with law enforcement, and offered information on other activists in the Operation Backfire cases. “The entire time they never actually told me what they were investigating or why I was being called to testify,” Wong said.